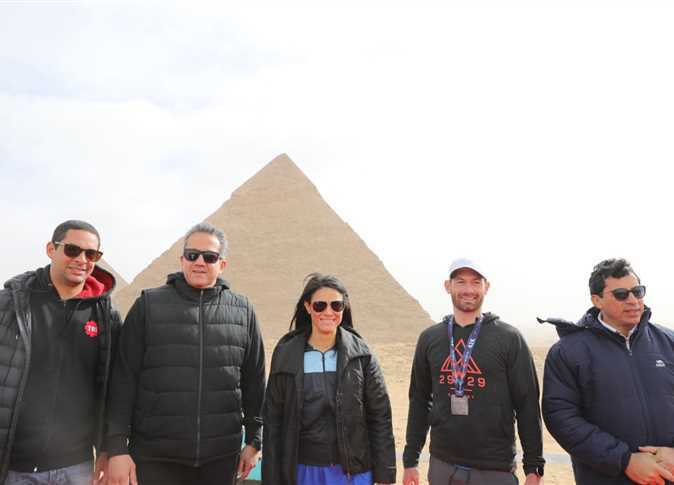 Tourism Minister Rania al-Mashat, Antiquities Minister Khaled al-Anani and Sports Minister Ashraf Sobhy were present in the Friday morning launch of the Pyramids marathon, organized by a company specialized in the organization of sporting events. The marathon was attended by about 4000 contestants, including 500 foreigners who came to Egypt from 75 countries around the world to participate in the race held at the Pyramids of Giza which includes running at 42, 21 and 10 kilometers. An award was handed over by the ministers to the first-place winner, an Olympic champion from Australia. Mashat expressed pleasure at participating in the event, stressing that the ministry supports all efforts to promote Egyptian tourism, and thanked the participants and organizers. She praised the importance of the event, which blends cultural and sports tourism, and hoped to see similar events and new ideas attracting attention to Egypt’s tourist destinations. Sports tourism has become an important means to attract diverse segments of tourists and young people around the world, she said, referring back to her participation in the inauguration of the first sports hotel in the Middle East in Hurghada several few months ago. Mashat added that this year will also witness an important sports event hosted by Egypt: the Africa Cup of Nations, scheduled in June. She stressed that Egypt’s organization of such events contributes to the development of the country’s agenda to attract tourists throughout the year.